**waves** Hi everyone -- I'm not dead, I promise. I started the new year very hopeful and then got the wonderful news that I have heel spurs in both of my feet. They are very painful and it totally made me slam on the breaks with walking, going to the gym. Steroid shots didn't work, going to physical therapy next. But if that doesn't work, I may have 2 more surgeries ahead of me. Fun! 1. Rebecca Scritchfield is my dietitian and my friend. 2. She did give me a copy of the book to review and enjoy, but not before I had purchased a copy for myself. It's taken me reading the book twice to really process a lot of Body Kindness. My first read had me thinking that the book was organized wrong, and the second read had me convinced that you could read each section out of order and see something you might have missed if you read the book from front to back. 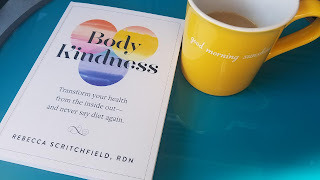 I realized that Body Kindness wasn't organized wrong: it was organized to undo a lot of the familiar harm (from easier to undo to harder to undo) we've seen in countless other diet/weight loss/fitness books and articles in order to open the reader up to a new way of thinking about not just their body but, more importantly, their life. I should have known that Rebecca would be sneaky like that and make the book a gigantic head fake (a Randy Pausch term for indirect learning). Where you belong ("The relationships every single one of us needs that provide the opportunity to be part of something greater than ourselves"). For me, it's humbling to think of my own life in the context of such miraculous and historical beauty [the Grand Canyon]. How can I waste another moment of my short years on this planet down-playing the miracle of this body I have been given? From tiny cells we become the most beautiful thinking, breathing, feeling creatures on earth. What an amazing gift we have been given, and how dare we squander and abuse it? In other words, this book is about the pre-contemplation phase (I call it "foundation," but "re-calibration" also works) that every person must go through BEFORE deciding they want to make a change in their life. And, in my opinion, the first part of that epiphany is realizing that you deserve a life that you love–a life that's more than just going through the motions of what is expected or what you think others want you to be. Body Kindness doesn't just ask the tough questions, but it also offers a method (not a prescription) to build a strong foundation based on the Body Kindness Pillars of "love, connect, care." Rebecca took some of the best lessons (such as mindfulness and forgiveness) and data (such as how diets are manufactured to fail) from many different places and put them all in one space without getting bogged down in pages of footnotes or endnotes. Her words echo the wisdom of our bodies that we already know to be true–wisdom that has spent a lifetime fighting bad science, bad theory, and bad influences. I found that I would read a few pages and then need to put the book down because of a few reasons (1) it's hard to read books when you have cats (2) something rang true for my own life (3) something made me think of someone I loved (both alive and no longer with me) and I wished they had read the same words to help them escape their self-inflicted suffering. I found myself on Amazon, sending people that I love copies mid-sentence. I found myself quoting it to friends. The "Spiral Up" on page 260 helped me come to peace with some things that had been weighing me down but also took some time and compassion to let go of. I would recommend Body Kindness to anyone who needs to get a tune up and get their head back in the right place. I'd recommend this book to anyone who needs to let go of the negative thoughts/feelings/behaviors that have constricted their life. I would recommend this book to anyone who needs the reassurance to give themselves permission to trust themselves about themselves. I'd recommend this book to anyone who wants to reconnect with themselves and the world around them. I'd also recommend this book because it had me laughing out loud quite a few times (ahem, page 245... that was unexpected, but such generous honesty). I'd also recommend Body Kindness to anyone who needs to detox themselves from diet books, diet articles, fitness books, fitness articles, and self-help people trying to sell expensive ideas. Rebecca might have screwed herself out of a sequel by publishing this very complete book.